Whether it's fact or fiction is tough to tell. Most studies are small and inconclusive. On the other hand, if college students believe in it, does it really matter? 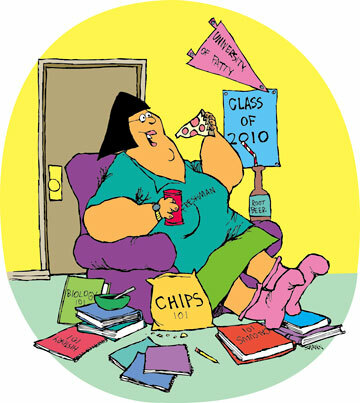 With the school year well under way, students might be alarmed by what they see when they look in the mirror, that infamous affliction known as the "Freshman 15." That's right -- what started as the Freshman Five, the extra five pounds gained by students in their first year of college or university life, has been inflated to match students' increasing girth. "Girls around campus have lost their waistlines," said Dr. Joannie Dobbs, a nutritionist with University of Hawaii Health Services and columnist for the Star-Bulletin. Earlier this week, she invited me to Hale Aloha, the dormitory cafeteria at the University of Hawaii-Manoa, to witness firsthand the makings of those extra pounds as students stacked their trays full with pizza slices, burgers, grilled cheese sandwiches, french fries and taco salad. Fried saimin and ice cream were also among the students' favorites. Students coming from a typical household are not prepared for the sudden abundance of food served up in the college cafeteria. The typical buffet-style meals offers the temptation to load up on whatever you want, and stress can cause students to overindulge. "Students come to an array of foods that they are not used to eating," she said. "Kids from the mainland may not be familiar with saimin, which has a fair amount of fat. The dry packaged saimin has 16 grams of fat and is higher in calories than a package of Fritos," she said. "If you are going to have a burger with a salad, its not such a big deal," she said, but a burger combined with fries, pizza and no greens is another story. "They look toward comfort food. ... They are away from home and may be homesick. Individuals tend to consume the things that they like most." College kids tend to just eat for flavor, she said, and eating cereal for dinner and loading up on carbs in the morning is not an unusual practice in school cafeterias. Many students eat 800-calorie muffins or bagels for breakfast and eat a mere salad for lunch, which means they're missing out on protein, she said. Another problem is that a great number of students do not eat breakfast, and that can cause them to overindulge later. "If you are really hungry, you will eat more at one meal than if you spread it out throughout the day," Dobbs said. A healthy, balanced lifestyle is necessary to avoid the Freshman 15, which doesn't have a single cause. Adjusting to college life, studies and young adult romances (or the lack thereof) makes diet seem unimportant. Dobbs said that picky eating is one of the main contributors to weight gain. When caloric needs are not met through a balanced diet, fatigue sets in and that takes a mental as well as physical toll. "They end up not getting everything out of college -- they are too tired to be social," Dobbs said. Food sciences graduate student M.J. Hsieh knows the value of balance in her meals. 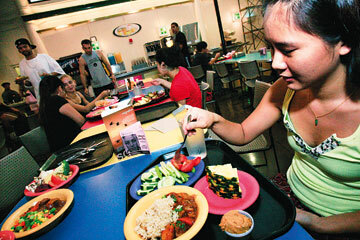 She chose plenty of fruit and vegetables to go with her main course at the Hale Aloha Cafeteria on the University of Hawaii campus. STOCKING UP on high-caloric, quick-fix foods can also leave students deprived of vital nutrients. "Variety is really important," Dobbs said. "Many students skimp on food plans and buy additional snacks from the store. You can't get all your calories from snacks." Dobbs links the increasing problem to use of computers as an all-purpose companion. "We went to school and then out running around. We weren't sitting around, sending e-mail and spending time on MySpace," she said. "The change in activity levels is probably the biggest factor," agreed Dr. Alan Titchenal, Star-Bulletin columnist and sports nutritionist in the Department of Human Nutrition, Food and Animal Science. "We didn't have shuttle buses on campuses ... we needed to walk or bike. Students could probably get to class quicker by walking, but they wait for the bus," he said. "There are lots of opportunities to be inactive." To experiment, Dobbs asked five students to wear pedometers for a day. "All of them said they were very active," she said. When they returned the pedometers, she found they took an average 2,500 steps a day. "I average about 6,000 to 10,000 a day," Dobbs said. Freshman Nichole Souza takes a plate of nachos from Sodexho worker Anna Areola, left, at the Hale Aloha Cafeteria. ON THE UPSIDE, there are students who eat well, who find their way to the cafeteria's vegan and vegetarian dishes. Cafeteria operator Sodexho hosts a new program, "Balance, Mind, Body and Soul," which offers nutrition and health information via a Web site, www.uhmdining.com/ nutrition.html. The nutritional value for items served -- including condiments, beverages and desserts -- is also posted throughout the cafeteria. The hardest part: "They need to control themselves, the amount of food they eat," said Hale Aloha manager Brian Takatsuka. His staff will help students with special dietary needs when requested. "A couple of the students are allergic to wheat," he said. "We will go in the back and make them a special stir-fry or some plain fish or chicken. We try to help them out as much as we can."